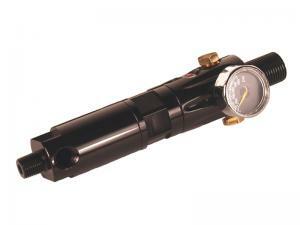 A combination of our tank and inline regulators, this two-stage reg is designed for installation directly into an HPA bottle and allows for input pressure up to 5000psi. Perfect for use in air shifters and a variety of custom applications, output is adjustable 0-500psi. A lower pressure version with output of 0-300psi available upon request (please call us to specify a custom build.) The male version has one 1/8" NPT male and one 1/8" NPT female port, giving you the option of having dual outputs or a single output and a gauge. Pressure is adjusted with a set screw on the side.